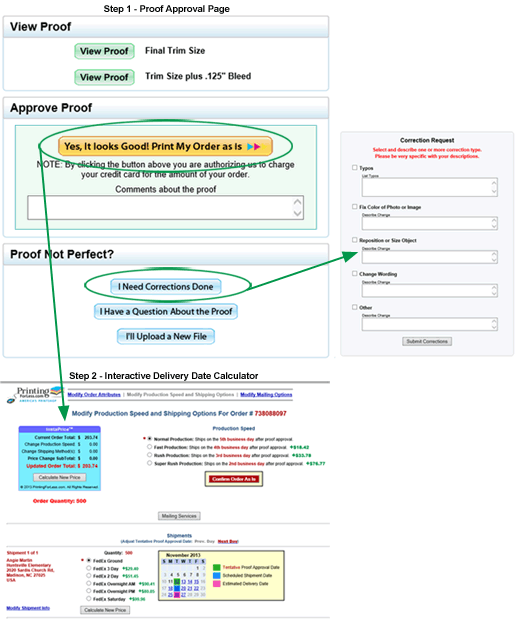 A "proof" is a preview of your press-ready file, allowing you to examine and confirm layout, text and content before your order goes to press. We rely on your thorough inspection of the proof to detect and correct errors. Orders will not go to press until we receive your proof approval. Online & hard proof options are available. All of our pricing includes a free online "soft" proof. You should receive a link to your online proof within one business day after we receive your electronic files. When your proof is ready, we will send you an email with a link to your PDF proof, as well as attempt to contact you by phone. If you don't have the necessary Acrobat Reader software, Adobe offers it as free download. We can also provide a JPEG proof if you don't have Acrobat Reader and are not interested in using it. We will post a webpage containing a preview of your file that you can easily view with your favorite web browser. We will email you the address to this private website when the JPEG proof is ready, as well as attempt to contact you by phone. We offer two "hard" proof options—hard copy mock-ups & hard copy proofs. Be aware that hard proofs add time and cost. While hard proofs provide a better sense of color than online proofs, they are not intended to be, and cannot be, a precise color match to your final printed piece. When placing your order specify in "Special Instructions" which hard proof you prefer and that you agree to pay the additional charges. Once we receive your order, we will update your preferences and email you a revised receipt. The hard copy mock-up should be used to verify composition and content of your piece. It is NOT intended as a color guide. The mock-up will be sent via Next Day Air and does not need to be returned. Prices are the same for one or two sides and include cutting, folding, stitching and any other work necessary to produce an accurate mock-up. This proof has good color accuracy; however it is just a guide. The presses we use are high quality offset presses and have a slightly different color gamut. Also, paper can and will affect color. Our presses run to industry-wide trade standards and not to match this proof. Print out a "hard copy" of the online proof and compare it to a printout of the original file you sent to us. We have found that it is much easier to proofread and catch minor changes on paper than on a computer monitor. Keep in mind that most desktop printers will cause significant inaccuracies in panel sizes and margins. This resizing is NOT part of your file—be assured that we have checked and adjusted your project so that it has proper bleed and panel dimensions. Have a friend or co-worker give the proof a quick review; a second set of eyes will often notice things that you overlook. Are photos, text & graphical elements extending off the page as intended? Check the Proof PDF for appearance at final trim size. The Press-Ready PDF includes .125" bleed margins which will be trimmed off. Color accuracy in your online proof will be affected by the RGB-CMYK conversion, what type of monitor you have, as well as monitor calibration. If you have critical color concerns, consider consulting a CMYK swatch book or a hard copy proof. Verify the spelling of people and place names. Double-check that dates match up with the appropriate day of the week. Pay special attention to addresses, phone numbers, email and web addresses. Fold lines are indicated only on the Proof PDF; they do not appear on the Press Ready PDF. Pink lines are placed on the outside of the piece; blue lines on the inside. Make sure the fold line indicators are positioned accurately on screen, as most desktop printers will cause significant inaccuracies in panel sizes and margins. Is text displaying in the correct font? Double-check for any special symbols, characters or clip art. Are the front & back sides correctly backed up? Do all photos, graphics, clip art, and text blocks display intact and in the correct position? Recommended resolution for printing is 300 dpi; computer monitors generally have a display setting of 72 or 96 dpi. If we indicate that some of your images have low resolution, they may not look bad on your monitor but will likely print blurry or jagged. If higher resolution images are available, please upload them to us. Are sentences & paragraphs lining up the way you intend? Check for unintended hyphenation and spacing. Don't tarnish your professional image - proofread thoroughly. The speed of your proof download is dependent on file size, Internet connection speed and the volume of Internet traffic. It's easy to make changes to your order attributes—quantity, paper type, ink, coating and folding. 2. You are now presented with an interactive version of the product ordering page. button. You then have the option to view, print or email an updated receipt.